I'm trying to program my ice40 HX8K. 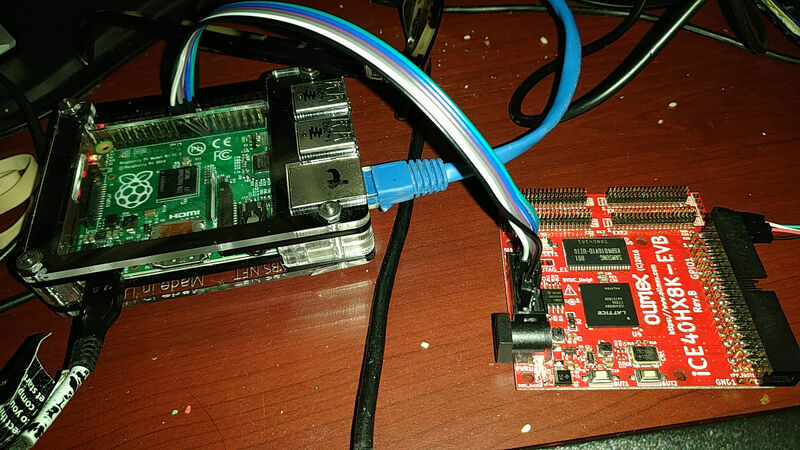 I am using a pi B+ ver2, which is offered as an alternate programming method on the wiki page for this board. These instructions are for the HX1K, so my connections are different. I have checked all my connections, tried switching from CE0# to CE1#, tried switching MISO and MOSI, tried all /dev/spidev?.? devices, tried rewiring to use SPI1 (pins 36-40), tried different baud rates, tried building flashrom from source (instead of using the packaged version), and rebooted. I have also tried powering the board via the raspberry pi, and using a pi rev 3 B. The jumper cables have been checked. I have the spi interface enabled in /boot/config.txt. I first asked on #raspberrypi on freenode, and again on ##electronics, but they were out of ideas. Thanks in advance for any suggestions. > These instructions are for the HX1K, so my connections are different. Well it's more that the original instructions were for using IDC connectors and I am making the connection with jumper cables, as seen in the picture. Again, I have listed out the connections I made in the code box in the original post. I have checked them against the schematic for the HX8K and the pi. I gave up on using 32u4 board because my version was 'A'. Changing the port numbers to match did not work plus the port jumped between /dev/ACM0 and /dev/ACM1 on board reset. I configured a cable and flashrom software for a Pi 3B per the notes at the end of the Linux setup. The files were modified in the ice40hx1k-evb for the ice40hx8k.evb. perform the make, leaving you with an example.bin. The .bin file generation is done my main Ubuntu system. A Samba share on the Pi was used to transfer the bin to the Pi. Note that readflash should be executed at least once before writeflash to setup gpio24. Or, just copy the first two lines from readflash to writeflash. I prefer this solution as it has been working reliably. Flashrom is well supported on linux.